When thousands of once-sealed government documents in the Russia collusion hoax are released in unredacted form, “those who eagerly assumed the role of the hunters may become the hunted, due to their own zealous violation of the nation’s trust and its laws,” columnist Victor Davis Hanson said. Now, those “who cried the loudest about leaking, collusion, lying, and obstruction are themselves soon very likely to be accused of just those crimes,” Hanson wrote for the Center for American Greatness on March 31. Andrew McCabe: The former FBI deputy director currently is under criminal referral for lying to federal investigators about leaking to the media. He and Deputy Attorney General Rod Rosenstein each have accused each other of not telling the whole truth about their shared caper of trying to force President Trump out of office by invoking the 25th Amendment. James Clapper: The former director of national intelligence has admitted to lying under oath to Congress – and since lied about his earlier admission of that lying. His recent sworn congressional testimony of not having leaked information about the Steele dossier to the media is again likely to be untrue, given that Clapper had admitted to speaking to CNN’s Jake Tapper about the dossier’s contents. CNN, remember, would in turn go on to hire the mendacious Clapper as an analyst. And once on air, Clapper would insist that Trump was both a Russian asset and thus guilty of collusion crimes greater than those of Watergate. Lies. All lies. John Brennan: The former CIA director has admitted to lying under oath to Congress on two occasions. He may well face further legal exposure. When he lost his security clearance, he repeatedly lied that Trump was guilty of collusion, however that non-crime is defined. 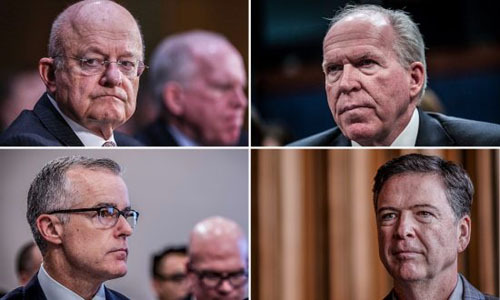 And as the Mueller probe wound down, Brennan with pseudo-authority and trumped-up hints of phony access to secret intelligence sources deceitfully assured the nation that Trump within days would face indictment – perhaps along with his family members. Huma Abedin and Cheryl Mills: The Hillary Clinton aides likely also lied to FBI investigators when they claimed they had no knowledge while working at the State Department that their boss was using an illegal private email server. In fact, they had read her communications on it and actually inquired about its efficacy. Samantha Power: The former UN ambassador in her last year in office requested on more than 260 occasions to unmask names of Americans monitored by the government. Yet Power later claimed that most of these requests were not made by her. And yet she either does not know or does not cite who exactly used her name to make such requests during the election cycle. In any case, no one has come forward to admit to the improper use of Power’s name to request the hundreds of unmaskings. Susan Rice: The former Obama national security adviser could have made a number of unmasking requests in Power’s name, although she initially denied making any requests in her own name – a lie she immediately amended. Rice, remember, repeatedly lied on national television about the cause and origins of the Benghazi attack, denied there were cash payments for hostages in the Iran deal, misled about the conduct of Beau Bergdahl, and prevaricated over the existence and destruction of weapons of mass destruction in Syria. Bruce Ohr, the former deputy attorney general did not tell the truth on a federal written disclosure required by law when he omitted the key fact that his wife Nellie worked on Christopher Steele’s Fusion GPS dossier. Ohr’s testimony that he completely briefed key FBI officials on the dossier in July or August 2016 is not compatible to what former FBI attorney Lisa Page has testified to concerning the dates of her own knowledge of the Steele material. Along with the lying, there was the leaking. Hanson noted that “Many of the names unmasked by requests from Samantha Power and Susan Rice were leaked illegally to the media. James Comey himself leaked confidential memos of presidential conversations to the press; in at least one case, the memo was likely classified. “Former FBI general counsel James Baker is currently under criminal referral for improperly leaking classified documents. He seems to have been in contact with the media before the election and he may have been one of many FBI officials and contacts, along with Christopher Steele, that reporters such as David Corn, Michael Isikoff, and Julia Ioffe anonymously referenced in their pre-election published hit pieces on Russian collusion – all the result of the successful strategies of Fusion GPS, along with some in the FBI, to seed unverified anti-Trump gossip to warp the election. Andrew McCabe also is under criminal referral both for leaking classified information and then lying about it. Hanson noted that “A number of FBI and Department of Justice high ranking employees such as James Comey, Andrew McCabe, Rod Rosenstein, and Sally Yates all signed off on FISA warrants to surveille Carter Page without apprising the courts that they knew that their chief evidence, the Steele Dossier, was unverified, was paid for by Hillary Clinton, and was used in circular fashion as the basis for news accounts presented to the court. Nor did the Justice Department and FBI officials apprise the FISA justices that Christopher Steele had been terminated as an FBI source. Then there’s conflict of interest. Hanson noted that “Andrew McCabe never should have been in charge of the FBI investigation of Hillary Clinton, given that just months earlier his wife had been the recipient of $675,000 in campaign cash donated by Clinton and Democratic Party-affiliated political action committees. And the apology of a “time line” that suggests conflicts of interest like McCabe’s expired after an arbitrary date is specious. McCabe knew his spouse had been a recent recipient of Clinton-related money, knew that he had substantial influence on the fate of her email investigation, and hoped and assumed that she was likely to be the next president of the United States quite soon. “Rod Rosenstein never should have been appointed acting attorney general in charge of oversight of the Mueller investigation. He knew Mueller well. In circular fashion, he had drafted the rationale to fire Comey that had prompted the Mueller’s appointment. He had signed off on a FISA warrant request without apprising the court of the true nature of the Steele dossier’s origins and nature. He had met shortly before the Mueller appointment with acting FBI director Andrew McCabe to investigate the chance of removing Trump under a distortion of the 25th Amendment. So, in essence, Rosenstein had been one of the catalysts for McCabe to investigate removing Trump for his own part in the removal of Comey and then in Orwellian fashion joined McCabe’s efforts. “Comey deliberately leaked a classified memo of a presidential conversation, in which he had misled the president about his actual status under FBI investigations, in order to cause enough media outrage over his firing to prompt the hiring of a special counsel. That gambit succeeded in the appointment of his own longtime associate Robert Mueller, who would be charged to investigate “collusion,” in which Comey played an important role in monitoring the Trump campaign with the assistance of British national Christopher Steele. Hanson wrote that “It will be difficult to unravel all of the above lying, distortion, and unethical and illegal conduct. “The motives of these bad actors are diverse, but they share a common denominator. As Washington politicos and administrative state careerists, all of them believed that Donald Trump was so abhorrent that he should be prevented from winning the 2016 election. After his stunning and shocking victory, they assumed further that either he should not be inaugurated or he should be removed from office as soon as they could arrange it. “They further reasoned that as high and esteemed unelected officials their efforts were above and beyond the law, and rightly so, given their assumed superior wisdom and morality. “Finally, if their initial efforts were predicated on winning not just exemption from the law, but even promotions and kudos from a grateful President Hillary Clinton, their subsequent energies at removing Trump and investing in the collusion hoax were preemptive and defensive. Seeding the collusion hoax was a way either of removing Trump who had the presidential power to call them all to account for their illegality, or at least causing so much media chaos and political havoc that their own crimes and misdemeanors would be forgotten by becoming submerged amid years of scandal, conspiracies, and media sensationalism.